Blini are feathery light, wonderfully yeasty pancakes that hail from Russia but have found their way to Paris and beyond. Served with red caviar, smoked salmon or simply sour cream and dill, they make a spectacular starter for a festive meal. This is not a typical Everyday French Chef recipe in the sense that it requires time and patience — not the sort of dish you can make at a moment’s notice. But the result is well worth it. 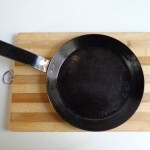 You will have an easier time of it if you have a blini pan — a small, tempered pan for making perfectly round pancakes one at a time (see below). If not, using a very flat skillet, you can make 3 or 4 at a time. This recipe is adapted from The Vegetarian Epicure by Anna Thomas (Vintage Books, 1972). She is of Polish, not Russian, extraction, but having tried many recipes, hers is the best I’ve found — perhaps because the egg whites are beaten into stiff peaks before being folded into the batter, which makes for extra fluffiness. I find it takes about 2 minutes to make each pancake. As the recipe makes 24-30 6-inch (15-cm) blini, this means that you will be spending about an hour over the stove. But not to worry. If you want to make your blini in two batches, you can store the batter overnight in the fridge. The yeast stays active, and the next-day pancakes will be just as good. The blini are best when served one at a time straight off the stove, but this is not always practical. If you are cooking for a crowd, as I usually am when I make this dish (generally just once a year, in winter), you can stack the pancakes on a plate. They will retain the heat until you’ve finished the lot, at which point you can serve them right away. Or you can wrap them in aluminum foil for reheating in a hot oven for 10 minutes just before serving. 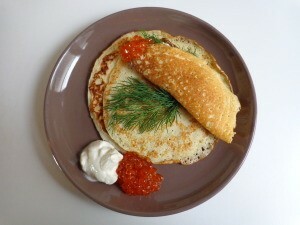 A word about caviar: Blini (the plural of blin, Russian for pancake) were traditionally served on festive occasions with black caviar (sturgeon roe). But now that the sturgeon has become an endangered species, red caviar (salmon roe) makes a fine substitute. Heat the milk in a large saucepan — it should be warm, not hot. In a very large bowl, combine 1 cup of the warm milk with the yeast. Stir to dissolve the yeast. Add the rest of the milk and stir again. Melt the butter and add to the bowl. Add the sugar. Mix with a wire whip. Add the flour to the mixture in the large bowl cup by cup, whipping well after each addition. Add the salt and whip again. Now whip the egg whites, using an electric beater, until they are stiff but not dry. Using a rubber spatula, fold the whites gently into the mixture. Add the heavy cream and fold again. While the batter is resting, prepare the ingredients you will be serving with the blini. If there’s red caviar, place it in a lovely small bowl with a spoon. If you’re serving smoked salmon, slice the slices into smaller pieces and arrange it on a plate, with sliced lemon on the side. In any event, you will want to have a bowl of crème fraîche or sour cream on the table, as well as a plate of fresh herbs — dill, and possibly also cilantro. When these ingredients are ready, place them back in the fridge until just before it’s time to sit down at the table. If you will be serving the blini as soon as they are ready, the table should be set before you proceed. When the batter has rested for 20 minutes, it will be frothy and fluffy — it may rise right up to the rim of your bowl. Return it to the kitchen and place it right beside the stove, with a small ladle at the ready. Place your blini pan or skillet over high heat. Add a little butter — enough to cover the bottom of the pan when it melts. When it’s good and frothy, ladle some batter into the pan. How much is a matter of experience. If using a blini pan, ladle in enough to cover the bottom plus a little more. If using a skillet, ladle in a few small rounds. The batter will look lacy, with little holes around the side. When the edges are dry, it’s time to flip the pancake(s). This takes about 90 seconds. Cook for another 30 seconds, and then transfer the pancake(s) to a plate. Repeat, stacking the pancakes, until the batter is used up. If serving at once, have a helper take the caviar, salmon and/or cream and herbs to the table. Bring the blini to the table yourself and prepare for applause. If serving later, wrap the blini in aluminum foil. Shortly before serving, preheat the oven to gas mark 6 (400 F, 200 C). Place the foil-covered blini in a pie tin and heat for about 10 minutes, then transfer to a plate and serve piping hot. Regarding blini pans, they are traditionally made of steel and should tempered before using. To temper a pan, fill nearly to the brim with salad oil and place over medium heat until the oil is very hot. Turn off the heat and allow to cool. Discard the oil and wipe the pan clean with a paper towel. After using the pan, do not wash with water or soap. Just wipe it clean with a paper towel. If there are bits sticking to the surface, sprinkle 1 tsp. salt into the pan and wipe clean with a paper towel. 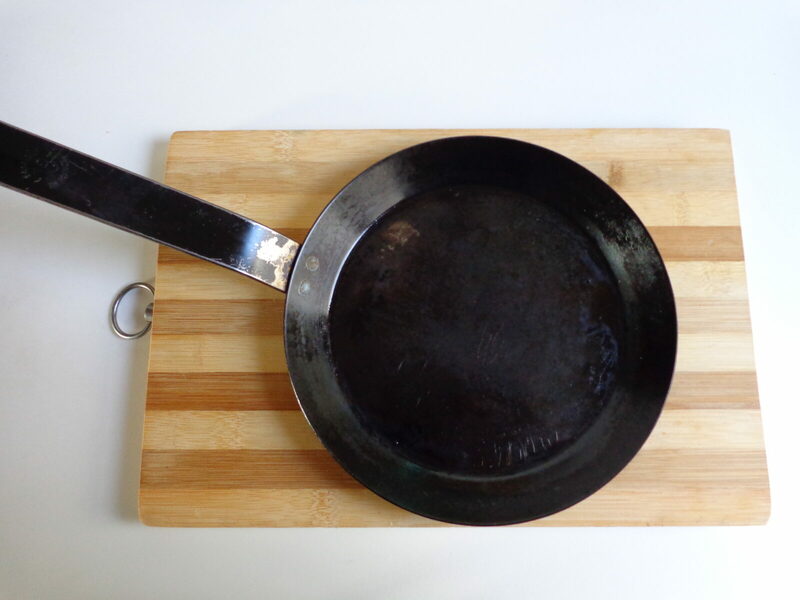 To keep the pan in good condition, you can wipe it with a little salad oil after use, wiping away the excess with a paper towel. There are now non-stick blini pans on the market, but as I have never used one I’m not sure how they work. They come in various sizes, and there are also versions with a few round indentations for making several blini at a time. This seems like an excellent idea. When do you add the other 3 cups of milk? Hello Lauren. Oops! You add the rest of the milk after dissolving the yeast. I have now amended the recipe to make that clear.